Old Town Trolleys Famous Nights of Lights Tour is an entertaining and family-friendly way to see the best of St. Augustine’s Nights of Lights. Old Town Trolleys Famous Nights of Lights Tour is an excellent way to see St. Augustine's Nights of Lights. This holiday spectacle of traditional white lights (some three million of them) has its roots, like everything in St. Augustine, in history. For the nearly 250 years that St. Augustine served as the capital of Spanish Florida, residents would place a lighted candle in their windows to mark the holiday season. Now the lights are electric, but they remain white, and they are dazzling to see as they decorate the wonderful old buildings, historic homes and bayfront vistas in the nation's oldest city. 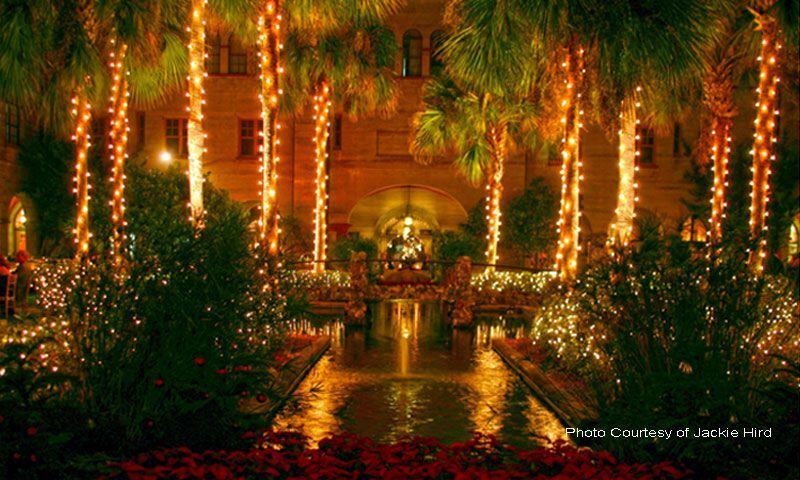 National Geographic magazine included St. Augustine's Nights of Lights in its recent list of the ten best places in the world to see holiday lighting displays. The 25th Annual Nights of Lights begins on the evening of Saturday, November 17, 2018, when the Mayor turns on the lights in the annual Lighting Ceremony. On the following evening (Sunday, November 18), the Old Town Trolleys Famous Nights of Lights Tour will begin touring visitors around the historic district to see the best of the Nights of Lights displays. The trolley tours depart continuously every night from November 18, 2018, through February 3, 2019. Operating hours are from 6:00 to 9:00 p.m. through the end of December, changing to from 6:00 to 8:00 p.m. in January and February. No reservations are required. The tour departs from the Visitor Information Center at 10 West Castillo Drive. General admission tickets are 13.99 for adults and $5.99 for children 3 - 12, while kids under 3 are free. No reservations are required or accepted for general admission seating. This year, Old Town Trolleys is offering a Fast Track Pass for their Nights of Lights Tour. The cost is $16.99 for adults and $8.99 for children 3 - 12, with kids under 3 riding free. The Fast Track Pass does require reservations, which may be re-scheduled up to 24 hours in advance of tour time by calling (904) 826-3663. To purchase tickets online and to make reservations for the Fast Track Pass, visit here. For many residents and visitors, Old Town Trolleys' Famous Nights of Lights Tours has become a part of their family holiday tradition during the annual Nights of Lights festival, offering a convenient and fun way to see the best of the lights and join with their tour guide and fellow passengers in impromptu caroling all along the way. Guests will even get a chance to vote on the displays they like the best in the annual Light Up the Night! contest sponsored by Old Town Trolleys. The Old Town Trolley Famous Nights of Lights Tour includes complimentary magical viewing glasses (which turn the lights into glittering snowflake or star shapes) and complimentary hot apple cider and homemade cookies. Tour participants also get a chance to vote in the 6th Annual Light Up the Night Contest, where guests help to decide which three businesses will be this year's winners for the best light displays in St. Augustine. Tours begin at the Visitors Information Center, located at 10 W. Castillo Drive, next to the downtown parking facility. On weekend nights and on the busy nights around Christmas, there will be live entertainment at the Visitors Information Center, making the trolley tour a true Christmas experience from start to finish. The holiday entertainment is provided in partnership with St. Johns County School groups and local musical acts. Parking is available at the city of St. Augustine's Downtown Parking Facility. Admission: General admission tickets, which do not require reservations, are $13.99 for adults and $5.99 for children (ages 3-12), while kids under 3 are free. The Fast Track Pass, which does require reservations, is $16.99 for adults and $8.99 for children 3 - 12, with kids under 3 riding free. To purchases tickets for both tickets and to make reservations for the Fast Track Pass, visit here. To re-schedule a Fast Track Pass ticket up to 24 hours in advance of tour time, call (904) 826-3663. 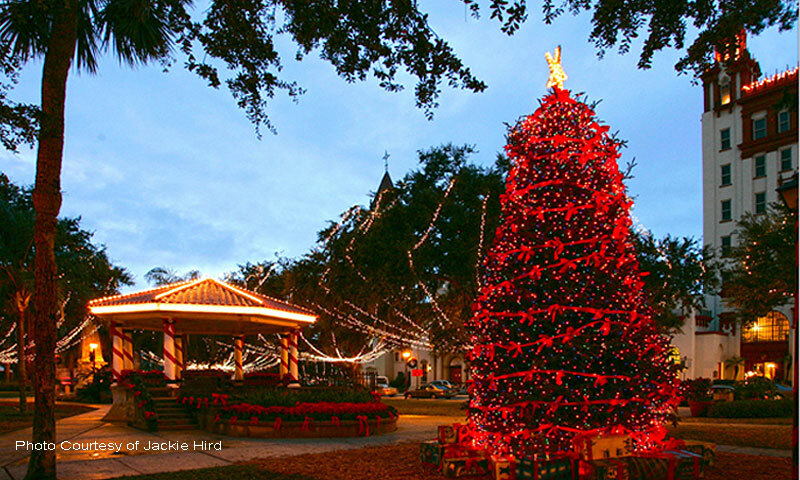 Includes: Free viewing glasses, cookies, hot apple cider, and a 30-minute trolley tour around St. Augustine's Nights of Lights. When: The Old Town Trolleys Famous Nights of Lights Tour departs every night from November 18, 2018, through February 3, 2019. Tours run from 6:00 to 9:00 p.m. through the end of December and then switch to a shorter schedule (6:00 to 8:00 p.m.) from January 1 through February 3, 2019. Where: Tours leave continuously from the Visitors Information Center located at 10 West Castillo Drive in St. Augustine, just across from the Downtown Parking Facility. For more information, call (904) 829-3800 or visit here.